07 Feb 2012 in book reviews in memory science fiction ~ read. The City of Gold and Lead is the second book in the Tripods series by John Christopher. I’m reposting my reviews in tribute to this great science fiction author who died this week. Will and his friends have been living with the renegade community in the White Mountains, undergoing training to help in the battle against the Tripods. Now, volunteers are needed for a dangerous mission, and the three friends hope to be chosen. The volunteers will travel to a city in Germany to compete in the yearly athletic tournament. The winners of the tournament get the “honor” of going to the Tripod’s city to serve the Tripods. If any of the volunteers win the tournament, they will have an opportunity to gather information from inside the Tripod’s city. But this could well be a fatal mission; no one has ever returned from the Tripod’s city. If they get into the city, will the heros be able to get back out again alive? The first part of this book is a little slow but once the story gets going it’s pretty exciting. 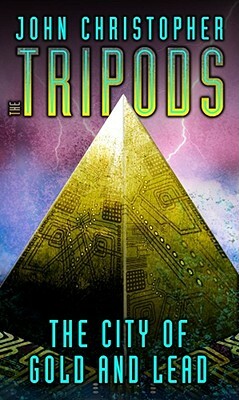 In this book the fight against the Tripods, or the Masters as they are called in this book, becomes much more personal. Whereas in the first book they are a somewhat remote threat, with only a few close encounters, in this book we learn much more about the horrors of the Masters dominion over the Earth. The battle becomes much more real, and much more necessary. There are a couple of scenes in this book that may be too intense for sensitive children.